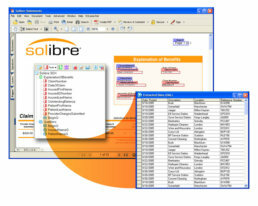 SOLindexer is a suite of PDF indexing tools for Adobe® Acrobat® and Reader® that provides an easy to use method for rapidly locating relevant information within transactional PDF documents. SOLindexer is comprised of two components: SDX Designer to visually define index fields, and SOLfinder™ plug-in user interface to search indexed documents. Note: SOLfinder™ installs separately from the Solimar Indexing Tools installation. Solimar Indexing Tools teams with Rubika™ and the Solimar® Print Director™ Enterprise (SPDE) to provide advanced PDF manipulation capabilities. SDX Designer is used to define templates that identify the information in a PDF document that is to be indexed. The resulting indexes are associated with key words, such as “Account Number” or “Client Name”, to facilitate the search process. In addition, SDX Designer allows users to qualify the indexing process so that only relevant information is captured. SOLfinder recognizes index fields created by SOLindexer and allows the user to search PDF files quickly and easily for information using familiar key words. SOLfinder can also print subdocuments of a report or extract them to a separate PDF document.